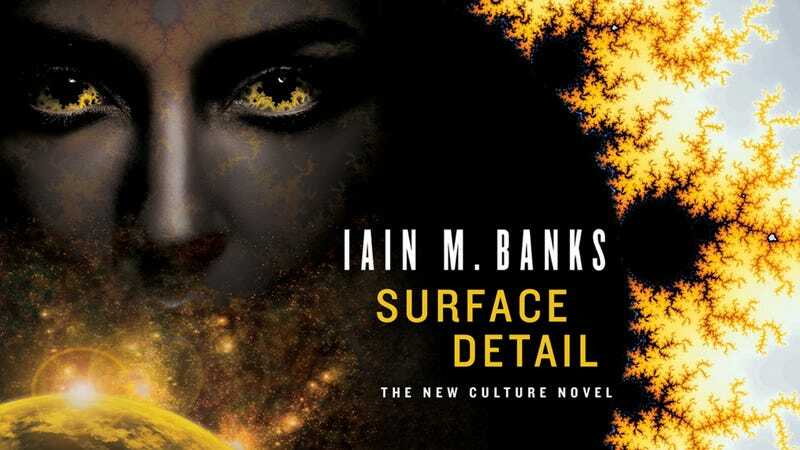 Iain M. Banks' new novel, Surface Detail, is some of the best work he's done in his galaxy-spanning Culture universe. A story of virtual Hell and true resurrection, it's about the consequences of technology that makes religious afterlives possible. At the center of a sprawling cast of characters - including hyperintelligent AI Minds, virtual avatars, politicians, slaves, and ambiguously-sentient alien habitats - is a woman named Lededje. She's from a vast but low-level civilization called the Sichult Enablement, which has space travel and advanced science but still embraces a form of slavery called "indented intagliation." When one family owes another money, they must give one or more of their children to pay those debts. The "indented" children are often bred expressly for this purpose, with a beautiful tattoo signifying ownership written into the structure of every cell of their body - essentially a fractal tattoo that covers the skin, and continues on into infinite smallness inside the DNA itself. Lededje is one of the most valuable tattooed "intagliates" owned by Veppers, a powerful businessman whose family made its first fortune in massive multiplayer games. Needless to say, Lededje isn't happy with her situation. Veppers rapes her over and over, and she runs away - only to be murdered by her vengeful owner. And that's when things get bugfuck, as a Ship would say. Because the dead slave wakes up a free member of the Culture, her mind downloaded into a new body. It turns out that a visiting Ship whimsically implanted her with a neural lace - the Culture tech that allows people to back up their brains, among other things - and her entire consciousness is beamed to the nearest Culture vessel at the moment of her death. It's typical of the Culture to meddle in other societies like this, and especially typical of eccentric Ships to become oddly attached to certain people for no particular reason. Lededje is just one of those lucky people whom Ships seem to like. Her relationship with one ship, a psychotic, ultra-high powered Abominator class warship named Falling Outside the Normal Moral Constraints, helps her salvage a sense of self from the wreckage. And propels her into the middle of a horrific war. It's a war over both religion and technology. The Culture and a few other of the "Involveds," advanced civilizations in the pan-galactic astropolitical scene, are trying to stamp out Hell. Turns out that the neural lace technology which backs up people's brains has uses beyond resurrection into a new body. Many societies, including the Culture, have built vast virtual Heavens for people who are ready to give up the physical world but want to keep on living in a less challenging environment. And a few societies have set up Hells for people they believe deserve everlasting punishment. The usual do-gooders aren't thrilled about consigning anybody to an everlasting torment in a sea of fire, pain, and degradation. Certainly the Culture doesn't approve. And so they and the Involveds agree to resolve the dispute by staging a massive, several-decade-long war in the virtual world to determine whether the Hells should be left standing. Unfortunately, at the moment Lededje is resurrected, the pro-Hell side is winning. As Lededje struggles to overcome the trauma of having lived through a real hell, a cast of other characters are coping with the reality of virtual Hell. Two figures whom we follow over the course of the book are Prin and Chay, legal scholars and social justice activists from a planet that embraces the idea of consigning people to Hell. But their politicians deny that Hell exists. So Prin and Chay get themselves inserted into a Hell so that they can see firsthand what goes on there, and return to testify. What they discover is so soul-flaying - described with the kind of loving, disgusting detail that Banks always brings to scenes of torture - that it drives Chay completely insane. And propels Prin into the galactic spotlight when he returns to testify. As we spiral outward from Prin and Chay into the virtual and real war rooms of battle over Hell, we meet players from politicians and special agents to soldiers, all of whom are on fire with moral certainty about what should be done with the dead. The war finally explodes out of the virtual into the real, much the way all religious wars do. With the war over the Hells, Banks brilliantly evokes a metaphor for religious conflict on Earth, which begins with spiritual disagreements and ends with burning buildings. But he's also cleverly within the realm of SF speculation here, spinning out a possible (and realistic) result of immortality technologies. What, exactly, will we do with the virtual avatars of our dead when we can upload our minds? Of course we'll send them to Hell. Why not? These matters of astropolitics don't matter at all to Lededje, however, who just wants to get back to Sichult in her new body and kill Veppers. That's how she hooks up with the Abominator ship. She's been assigned to a Ship with appallingly good manners, and Lededje aims to misbehave. Bored, warmongery, and possibly altruistic beneath it all, Falling Outside the Usual Moral Constraints agrees to take her home, though it doesn't promise to let her kill anybody. It's a Culture Ship after all. As they zoom ridiculously fast across the galaxy to Sichult, the two are tangled up in the war over Hell as it metastasizes into reality. Surface Detail is one of Banks' most successful Culture novels. The war to end Hell reverberates believably across personal and macropolitical subplots, and the entire story is infected with a wicked humor that is Banks' forte. There is an especially brilliant moment when he describes the juvenile humor of Hell, and from that point on you realize that this is a war whose premise is as absurd as it is dire. (Like all wars perhaps, but setting it in a virtual Eli Roth movie drives that point home.) Banks deftly evokes a society where technology makes religious beliefs a reality, without ever solving the basic problems religion has always caused. Wars rage over who (if anyone) should be consigned to Hell. And even though slaves can be reincarnated with godlike powers, they can't transcend the grievances of their previous lives. It's not necessary to have read previous Culture novels to appreciate Surface Detail, though of course familiarity with the Culture universe will help (io9 has a handy introduction to the Culture here). For fans of the Culture, there are a lot of worldbuildy bits that will delight you. The Abominator ship is a terrific character, completely mad, bloodthirsty and hilarious. And we get to know some new sections of the Culture's spy division Special Circumstances - Quietus, which deals with the dead in their virtual worlds; and Numina, which focuses on the Sublimed. Admittedly Banks' novel sometimes slaloms into long, tangential tales of minor characters who, while interesting, end up getting in the way of the action rather than advancing it. He also has a way of dropping major characters when he isn't sure what to do with them. Quietus agent Yime begins as a fascinating, multilayered person and winds up turning into a plot device doomed to lead an unsatisfying life for no real reason. Despite these few problems, this is a terrific novel that's as much fun to read as it is to talk about afterward. Ultimately the Culture's technology is like religion: It can invade your mind without you realizing it, and change your perspective forever. That can be liberating, or it can feel like centuries spent in Hell. You can buy Surface Detail from Orbit Books or your favorite bookseller. If you want wallpaper-sized images of the top image, you can get them via Orbit Books.